IMAGE - An artist's impression of an accretion disc and jet around a black hole. 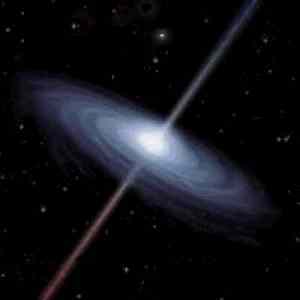 A Black Hole is a region of space where the gravitational force is so strong that not even light can escape from it. When were Black Holes first thought of? The existence of "Invisible Stars" was first suggested in the late 1790's by English and French scientists John Michell and Pierre Laplace. They independently calculated the mass and size that such a star would need in order to have an escape velocity equal to that of light (calculation). Black Holes are formed when matter collapses in on itself catastrophically so that more than a critical quantity of mass is concentrated into a particularly small region. At the centre of this region is a point of infinitely dense matter known as a singularity. The biggest black hole ever was the singularity from which the Universe formed in the Big Bang, but at the present time Black Holes similar in mass to ordinary stars are found in certain binary stars and very massive Black Holes exist in quasars. Why are Black Holes so difficult to see? A Black Hole traps all light within it and so it is invisible, and impossible to observe directly. However it still exerts its gravitational effect in the region around it and any matter falling towards the black hole is accelerated and may be heated up and emit radiation. Because the gravitational force is so large, the temperature can become very large and then the radiation is emitted as X-rays, which can be detected and studied by X-ray observatories such as XMM. Thus the X-rays come, not from the Black Hole itself, but from the in-falling material which forms an accretion disc around it and possibly also a jet (see the picture above).